One of the longest small college rivalry football games unfolds for the 92nd time Saturday (Oct. 20) when the Flying Dutchmen travel to Kalamazoo to renew the "Wooden Shoes Rivalry" Kickoff for Kalamazoo's Homecoming game will be 2 p.m. 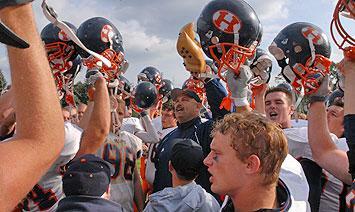 The Flying Dutchmen will renew their oldest MIAA football rivalry. It started in 1910 and has been known as the Wooden Shoes Rivalry game since 1931. Hope owns a 52-33-6 advantage in the all-time series, including a 22-16 victory in 2011. Kazoo last defeated Hope in 1995, coach Kreps’ first season at the helm of the Flying Dutchmen. This will be Kalamazoo’s Homecoming game. The traveling trophy, a pair of hand-carved Dutch wooden shoes, has been part of the rivalry for 81 years. For years the wooden shoes were viewed as unique among intercollegiate trophy games because when a tie occurred the head coach of each team could have one of the pair until the next year's game. That happened six times until the NCAA eliminated the tie game in 1996. The teams will be playing for the 92nd time. Both Hope and Kalamazoo are playing in renovated stadiums featuring artificial turf, the Flying Dutchmen at Holland Municipal Stadium and Kalamazoo at its Angell Field. Every MIAA football program now has an artificial turf playing surface. Kalamazoo’s project is part of a $16 million upgrade to its outdoor athletics facilities. The stadium will be dedicated prior to kickoff. Kalamazoo opened its season with three consecutive victories, but has now lost three in-a-row including twice against MIAA opponents. Hope lost four of its first five games, but has won the last two to improve to 2-1 in the MIAA. Hope quarterback Michael Atwell leads the MIAA in passing with 143 completions in 243 attempts (54%) for 1,584 yards and 13 touchdowns. He has been intercepted nine times. Kalamazoo quarterback Aaron McGuire ranks second in the MIAA in passing with 110 completions in 185 attempts (59%) for 1,205 yards and six touchdowns. McGuide tops the MIAA in total offense while Atwell is second. The difference is that McGuire has rushed for 364 yards while Atwell’s rushing total is a negative 26 yards. Stat Watch: The teams have nearly identical total offense numbers, the Flying Dutchmen averaging 363.6 yards per game as opposed to Kalamazoo’s 362.2 ….. The Flying Dutchmen have recovered 10 opponent fumbles and hold a 19-14 takeaway/turnover advantage ….. Hope punter Dean DeVries leads the MIAA with a 39.0 yards per punt average .…. Junior linebacker Tim Klaus is averaging 10.7 tackles per game, best in the MIAA. Hope College launches its swimming/diving season on Friday, Oct. 19, by competing in the MIAA Relays to be hosted by Calvin College at its Venema Aquatic Center. The meet involving all MIAA-member colleges will begin at 6 p.m. The meet is non-traditional in that every event is a relay. The outcome does not figure into the conference standings. Hope sophomore outside hitter Jenna Grasmeyer (Hudsonville, Mich./Unity Christian HS) has been named the Sports Imports/American Volleyball Coaches Association Division III National Player of the Week. She earlier was named the MIAA Position Player of the Week.